They are planning for a massive geoengineering project to inject sulphur into the atmosphere to combat global warming. I think they are insane. A program to reduce Earth’s heat capture by injecting aerosols into the atmosphere from high-altitude aircraft is possible, inexpensive, and would be unlikely to remain secret. “We developed the specifications for SAIL with direct input from several aerospace and engine companies. It’s equivalent in weight to a large narrow body passenger aircraft. But to sustain level flight at 20 kms, it needs roughly double the wing area of an equivalently sized airliner, and double the thrust, with four engines instead of two. The team estimated the total development costs at less than $2 billion for the airframe, and a further $350 million for modifying existing low-bypass engines. The new planes would comprise a fleet of eight in the first year, rising to a fleet of just under 100 within 15 years. The fleet would fly just over 4,000 missions a year in year one, rising to just over 60,000 per year by year 15. Probably bigger than the plane below. I’ve always thought that clean air laws decreased SO2 , increased sunshine and therefore warming. Well … there is a new law that may change climate. Studies have found that ships have a net cooling effect on the planet, despite belching out nearly a billion tons of carbon dioxide each year. That’s almost entirely because they also emit sulfur, which can scatter sunlight in the atmosphere and form or thicken clouds that reflect it away. In effect, the shipping industry has been carrying out an unintentional experiment in climate engineering for more than a century. Global mean temperatures could be as much as 0.25 ˚C lower than they would otherwise have been, based on the mean “forcing effect” calculated by a 2009 study that pulled together other findings (see “The Growing Case for Geoengineering”). For a world struggling to keep temperatures from rising more than 2 ˚C, that’s a big helping hand. And we’re about to take it away. In 2016, the UN’s International Maritime Organization announced that by 2020, international shipping vessels will have to significantly cut sulfur pollution. Specifically, ship owners must switch to fuels with no more than 0.5 percent sulfur content, down from the current 3.5 percent, or install exhaust cleaning systems that achieve the same reduction, Shell noted in a brochure for customers. There are very good reasons to cut sulfur: it contributes to both ozone depletion and acid rain, and it can cause or exacerbate respiratory problems. Sulfur pollution from coal burning has a similar effect. Some studies suggest that China’s surge in coal consumption over the last decade partly offset the recent global warming trend (though coal does have a strong net warming effect). 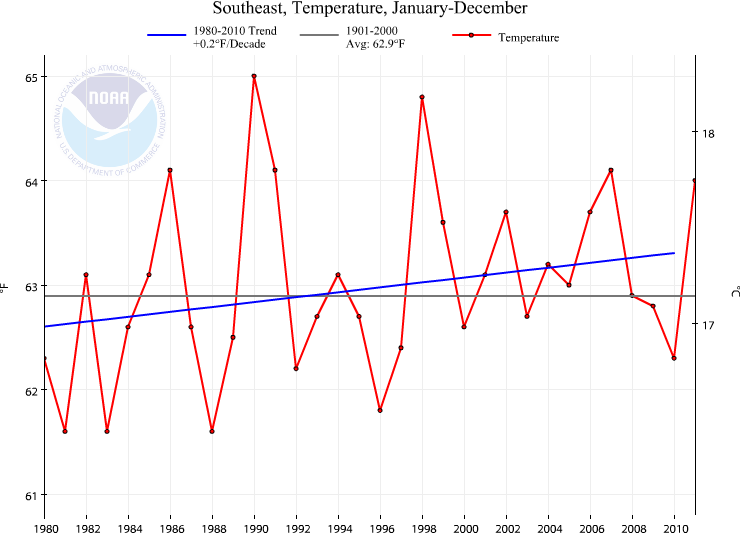 It’s difficult to estimate how much the new rule could affect temperatures. We don’t know enough about cloud physics and the behavior of atmospheric particles, nor how diligently the shipping industry will comply with the new rule, says Robert Wood, a professor of atmospheric sciences at the University of Washington. Another wrinkle is that ships emit other particles that can sometimes also stimulate cloud droplets to form, including black carbon, a major component of soot. Removing the sulfur from the fuel could alter the size and quantity of these particles, which could affect clouds as well, says Lynn Russell, a professor of atmospheric science at the Scripps Institution of Oceanography. “So we can’t really say exactly what the change will be,” says Russell, though she adds that the rule change is “likely” to produce a warming effect on balance. There is an AGW site called RealClimate (I’m not going to link to them). They have a post up mocking the use of volcano’s as a source of CO2/SO2 etc compared to human sources. I did a post a while back looking at the amount of SO2 produced by one volcano. Here is another news snippet from the same period. Admittedly this is unusual. But there are 3,000,000 undersea volcanoes. And they could have pumped out a lot of CO2 in the past. The climate-driven rise and fall of sea level during the past million years matches up with valleys and ridges on the seafloor, suggesting ice ages influence underwater volcanic eruptions, two new studies reveal. And because volcanic chains suture some 37,000 miles (59,500 kilometers) of ocean floor, the eruptions could pump out enough carbon dioxide gas to shift planetary temperatures, the study authors suggest. “Sulphur dioxide has been spurting too — 35,000 tons of it a day, more than twice the amount spewing from all of Europe’s smokestacks. The gas has spread across the Icelandic countryside, causing people to wheeze and trapping some indoors. NASA is telling lies about the southeast USA. 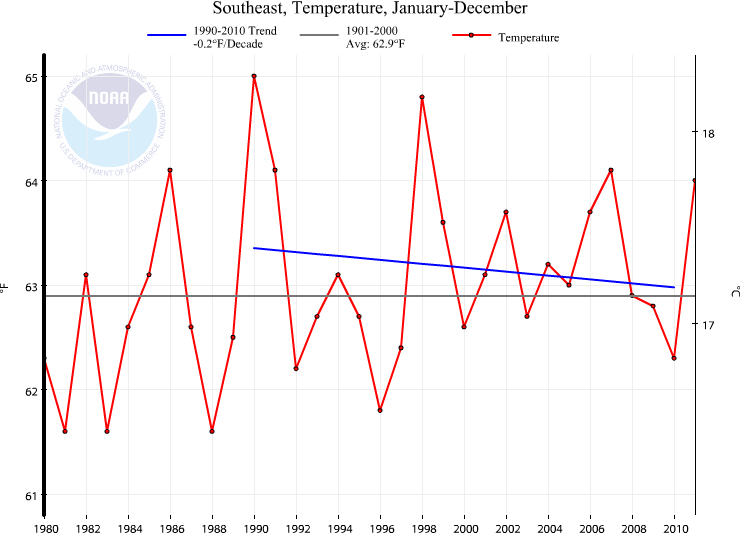 They claim that sulphates were causing the Southeast to stay cooler and masking AGW. For some reason they use the term “warming hole”. 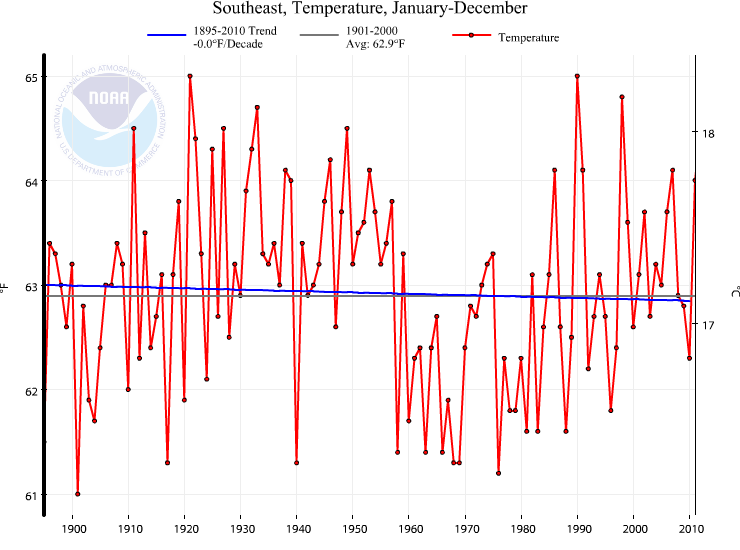 How do they explain that it was warmer in the southeast in the 20s and 30s than now? Here is the big lie that jumped out at me. The trend from 1980 to 2010 (using NASA’s own data) is indeed .2C per decade. But the trend from 1990 to 2010 is in fact negative. It is -.2C per decade. And the trend from 1895 to 2010 is FLAT! The Hockey Schtick points to a new paper that finds a large increase in sunshine over the last 26 years. “According to the authors, “the average increase of [surface solar radiation] from 1982 to 2008 is estimated to be 0.87 W m−2 per decade,” which equates to 2.26 W m-2 over the 26 year period. By way of comparison, this forcing was 12.5 times greater than the surface forcing alleged by the IPCC from increased CO2 over the same period. The abstract is here. The paper is here. The warming since 1980 was caused by clean air legislation in the the US, UK and Europe. I have posted several articles on this theme here , here and here.